Three layouts work well in limited spaces: the Pullman, the galley, and the horseshoe shape kitchen. Pullman kitchen, also known as a single wall kitchen, is used in a loft or very small space. Just as described, all the workspace, cabinets, and appliances are on one wall. The modern adaptation of the one wall kitchen adds an island for bigger spaces. 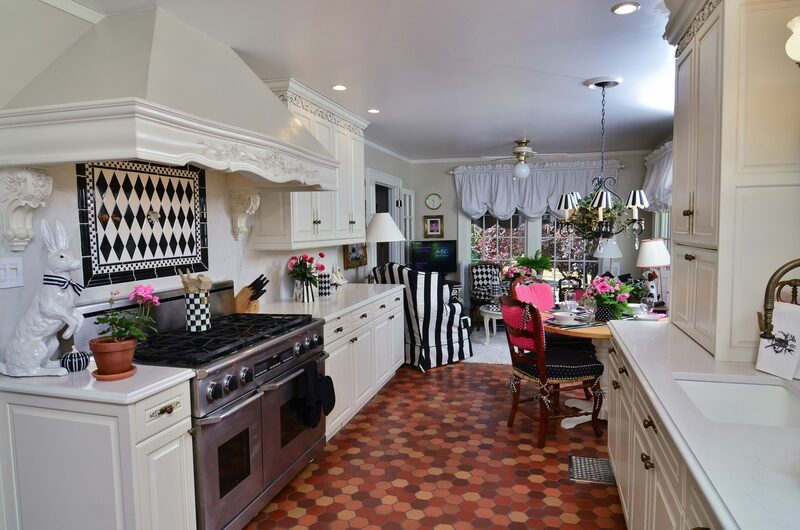 The galley kitchen and horseshoe shaped kitchen are very similar in that they both have two facing walls of cabinets, appliances, and workspace. Galley kitchen can be entered from either side and walked through, whereas a horseshoe can only be entered from one side. They have lots of workspace, though they are smaller and enclosed. In a galley kitchen generally only one person can work at a time in the space. A horseshoe kitchen can be considerably wider and often has either a sink or workspace at end of the U. One of the most common kitchen designs is the L-Shaped kitchen. This layout makes excellent use of a corner in a home. Depending on your available space, you can have as much or as little counter space as you require. The Peninsula kitchen, is a three-sided space. It is basically a connected island, it converts an L-shaped kitchen layout into a horseshoe or U-shape. The peninsula often is a room divider between the kitchen and dining or living spaces. 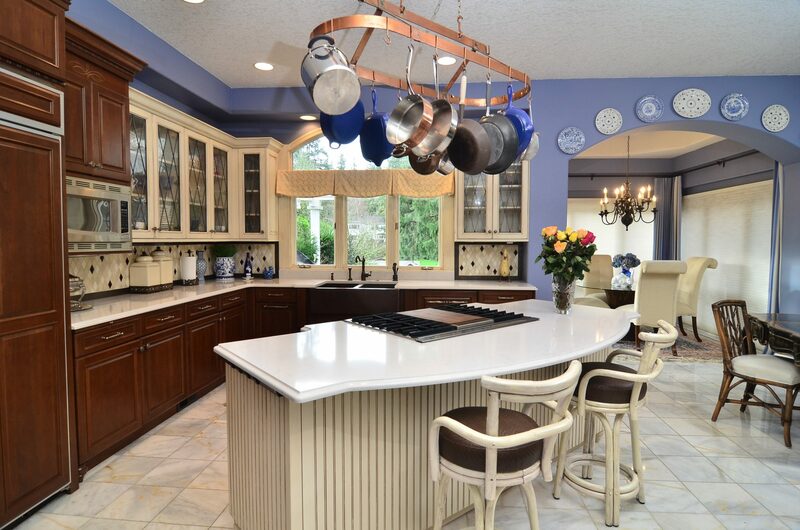 When you need multiple workspaces, having an Island kitchen is an ideal solution. It is the most preferred today. One of the benefits of an island kitchen is it’s flexibility. Islands typically include an eating space, a cooktop, sink or just workspace. Keep in mind that adding an island to a kitchen takes up a fair amount of space so make sure that you have the square footage available in your kitchen remodel. You want to be able to walk comfortably around the island. The modern adaptation of the Pullman kitchen often includes a stand-alone island with eating space. The benefit of adding an island to a home with a one-wall kitchen is that it frees up what may have previously been an eating area. We know that not everyone remodeling their kitchen has the luxury of gutting the kitchen to start from scratch. Most often the biggest limitation is limited available space. Your budget or if you’re remodeling a condo, your CC&R’s may prevent you from moving things like gas and water lines. We will work within your constraints to maximize your space and make it beautiful and functional. Here are a few different layouts that may suit whatever space you have. We carry a variety of product lines for different budgets. Whether you’re looking for a high end complete remodel or need new cabinets and appliances, we’re here to help you through the process. We’ll create a 3D rendering of your remodeled kitchen for you to look on our big screen at in our design center. Ovation Design-Build, your local kitchen remodeling company, can help you choose the right layout and design your space.Our professional design team knows how to make the most use of available space.